Estimated range display. Type /rangedisplay for configuration or /rangedisplay locked to lock/unlock the frames. RangeDisplay is a simple range display addon. It is using spell range, item range and interact-distance based checks to determine the approximate range to your current target. Due to the whackyness of interact-distance based checks, recent versions only use those when spell/item based checks are not possible . The display can be configured in many ways (displaying only the max range, adding border and background, etc). Currently you can set up RangeDisplay to show your current range to your target, focus, pet and mouseover units. The mouseover unit range can be anchored to the mouse or placed at a fixed position. New in v3.8.0: It is possible to add sound notifications to "range sections" (similar to color setting). The sound will be played when entering the section. If two sections have the same sound file attached to them, then the sound is not played again if switching between the two sections. This sound notification is enabled by default for the target unit's close range section. Displaying max range only: if you want to display only the maxRange, you need to set Text to "%d" and tick the Reverse option for the section(s). I don't think the values here are accurate. I'm compared them to Hard Yards (https://wow.curseforge.com/projects/hard-yards?gameCategorySlug=addons&amp;projectID=60094) and to my own spells and abilities in game. For example: Melee range is 5 yards or closer. I got close enough to a Dummy so that your addon displayed 0-4, Hard Yards displayed 5.1-6, and I could not melee attack the Dummy. Moving in slightly, Hard Yards changed to Melee, RangeDisplay stayed at 0-4, and I was able to melee attack the Dummy. Check the reply in the issue tracker. I don't think it's currently possible to get a "0 - 4" display based on looking at the code... Will check in-game later though. Doesn't seem to use the range limit indicators for friendly units correctly. Neither the number values or the color ones. I'm tearing out the options stuff into a separate addon, the upcoming alpha builds will most likely be BROKEN. I've applied your changes and re-packaged range-display. Please try the r211 alpha build, and report back if it works or not. Then, I can do melee attacks in 0 ~ 5 yards RangeDisplay displays. And, 5~8 yards is displayed, that was not displayed before modification. Bash is an instant melee attack, druid can achieve it at level 14 from trainer. 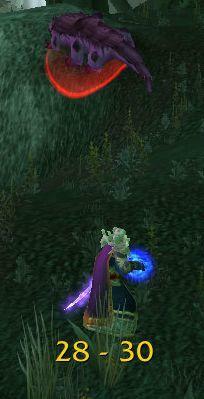 Maul is a range restricted spell, but at any range IsSpellInRange API returns 1. Been using disembeds for years; yes, used the newest RangeCheck library with that mod. No range problems. Its errors are (unfortunately) frame related, as with many old mods in WoW 3.x. Ahhh...so unlocking is what causes the increased CPU usage of RangeDisplay. One of the reasons I was such a fan of Simple Range Indicator--besides its superior aesthetic design--was because it used a fraction of the CPU time that RangeDisplay did when I last tested them (with OptionHouse). RangeCheck and all other libraries were disembedded, so it was an accurate comparative test. I did not lock RangeDisplay during the testing (that I can remember), so that's probably what contributed to the CPU time differences. Simple Range Indicator's frame was permanently movable, yet it used a lot less CPU than RangeDisplay. So may be worth looking at it to find a better way of handling those OnUpdates. If the bugs with SRI are range related, you might be able to fix it by using a standalone LibRangeCheck-2.0 (or copy the version from RangeDisplay to SRI). I have an open ticket that requests background setting, I'll look into it sometime. I'll see what I can do with keeping the frames unlocked, too (right now keeping it unlocked causes a lot of CPU waste, as OnUpdate is called even when you don't have a target), but since locking/unlocking is just a click away now with the minimap/LDB icon, I don't think it's that useful (and accidently eating up a mouseclick in the middle of a fight can be deadly...). Now that the terrific Simple Range Indicator (it also used the RangeCheck-2.0 library) is outdated and somewhat buggy in WoW 3.x, RangeDisplay has become my favorite mod of its type. Not a fan at all of a r187 change, though. "Made background uglier to make it more obvious that users should lock the frames". No actually, I don't need to be reminded to lock the frame. I have them unlocked because I prefer my frames movable (whatever they are: unit, healing, etc.). Its why I have not yet moved to oUF ;). So, I reverted that change on my local copy. Changed line 214 from ud.rangeFrameBG:SetTexture(0, 0.42, 0, 0.42) back to r186's ud.rangeFrameBG:SetTexture(0, 0, 0, 0.42) (frame went from an "ugly" green back to its original dark grey). Hope you'll reconsider the frame coloration for those out there that prefer to have their RangeCheck frames permanently movable. Heck, if you added an in-game alpha/color adjuster for the frames, it would be perfect :).